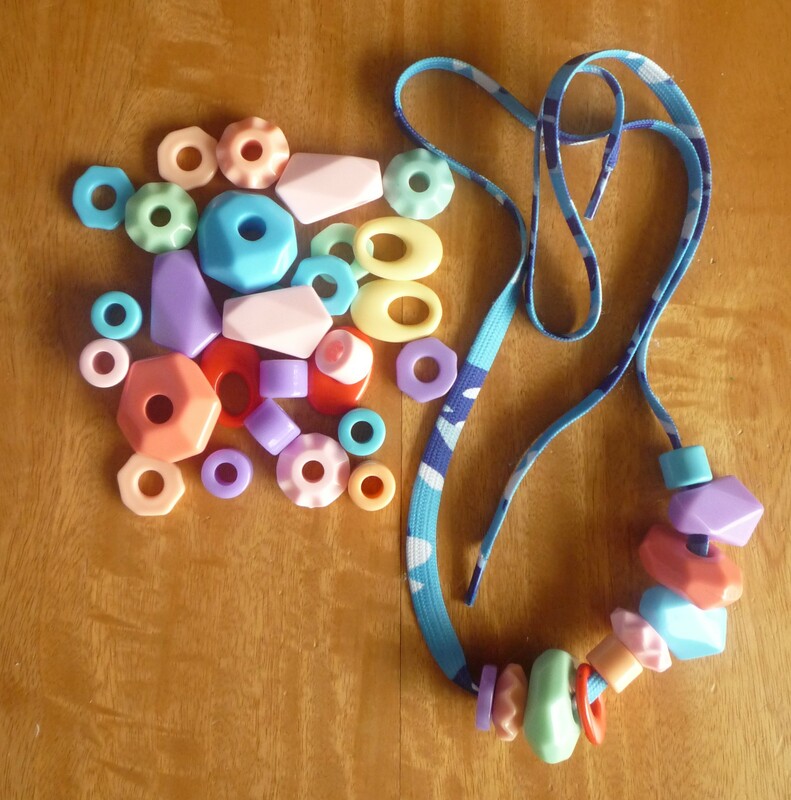 A while ago I posted about some easy home-made baby toys that I made for the twins when they were little. Things have moved on a bit since then (the twins are now 22 months old), and they require much more than a pompom or two to keep them occupied! Once again, Pinterest has been my friend and a great source of inspiration and I’ve tried a few things out that I’ve found on there. So I thought I’d share with you some easy activities that the twins enjoy doing. 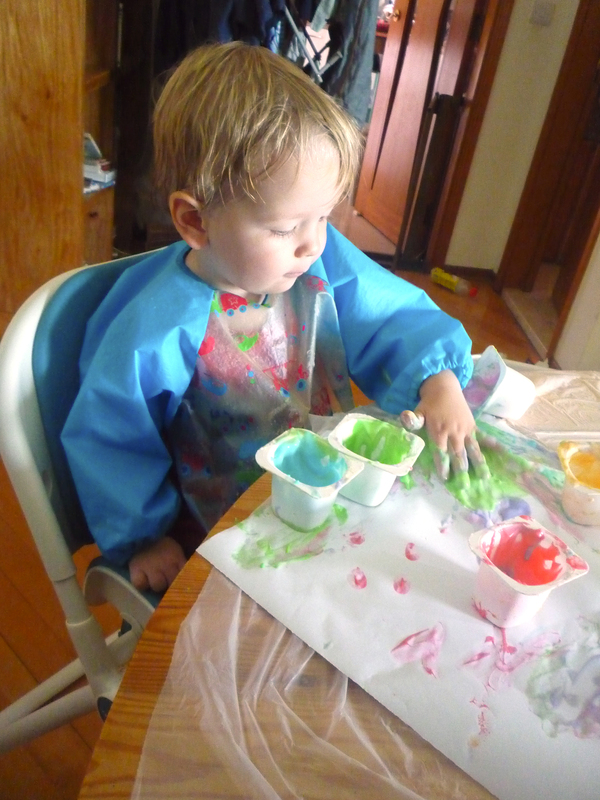 My twins still put things in their mouths, especially if it looks like it might be edible so I’ve been making this edible paint recipe from The Imagination Tree whenever we do painting. The paint itself is quite thick so it lends itself well to finger painting but when it dries it does crack a bit and tends to make the paper shrivel and warp a bit (instead of staying flat). Having said that, it’s quite easy and quick to prepare and I think it’s quite nice that it doesn’t have chemicals (bar the food colouring) in! My only tip is that sometimes it doesn’t thicken for whatever reason so I find that gently heating it makes it thicken up to the right consistency (which is apparently custard-like). Also, they will keep for a short while in the fridge, but I wouldn’t leave them too long (and they dry up a little so you need to add a bit of water to bring them back to the right consistency). 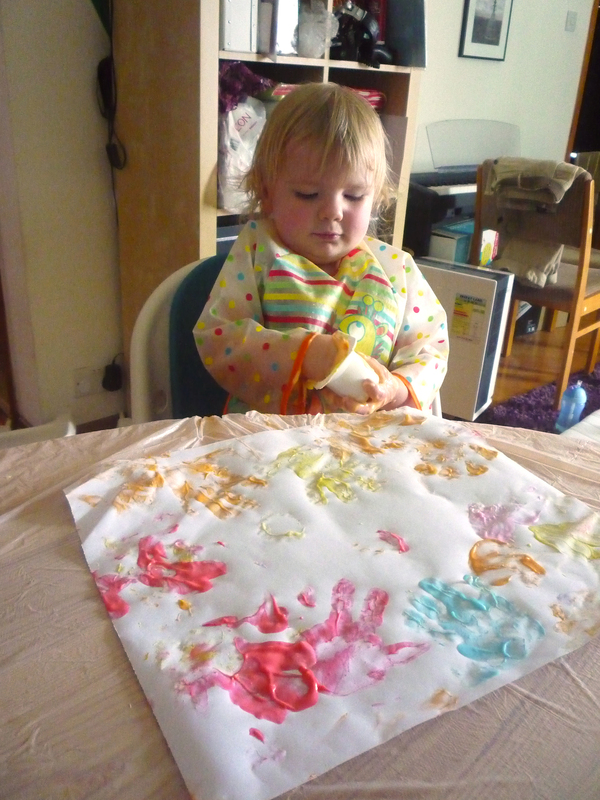 The twins aren’t overly into painting and drawing yet, but they will have a good go whenever I get these paints out – even if the enthusiasm often doesn’t last very long! This is currently one of the twins’ favourite activities and it comes out pretty much every day. Basically, I bought a number of large holed plastic beads from a bead shop in Sham Shui Po (Hong Kong’s craft district) and some shoelaces from a nearby market stall and gave them to the twins! 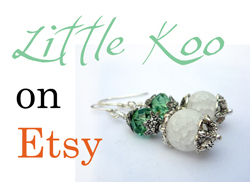 They love playing with the beads – and not just threading them on the shoelaces (which they still need help with). For a start, they find it much easier to put the beads on chopsticks, so they can stack them up and let them fall off again! The beads also get rolled around, put in pots and generally investigated and played with. I got this idea, again, from The Imagination Tree. 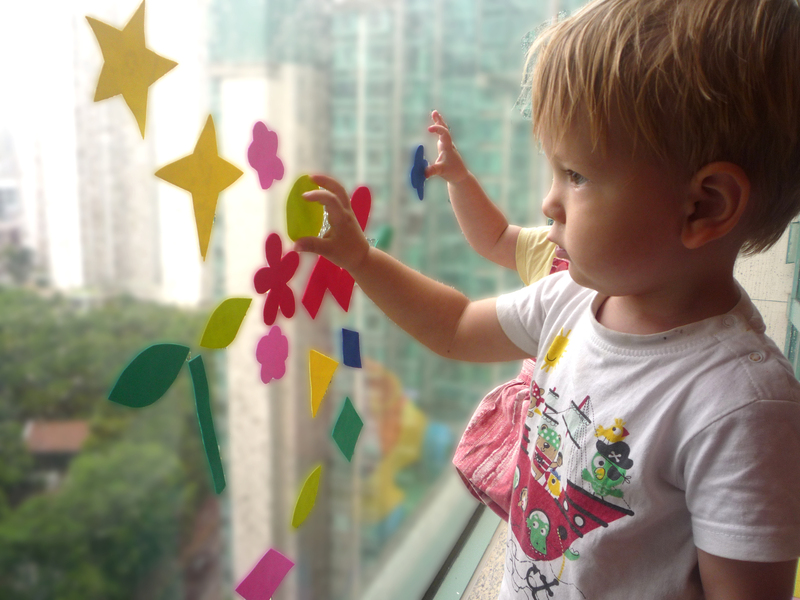 It’s so simple – cut shapes out of sheets of foam, make your window wet with a cloth (or they use a sponge in the link above) and let your toddlers stick the shapes on the window. It’s taken quite a while for the twins to get the idea that you stick the shapes on the window and don’t just pull off what mummy put there, but they are finally getting it. The window needs to be pretty wet (and in the heat of a Hong Kong summer it dries pretty quickly so we have to keep re-wetting it!) but the twins also like to make the window wet again so that’s another plus point for this activity. 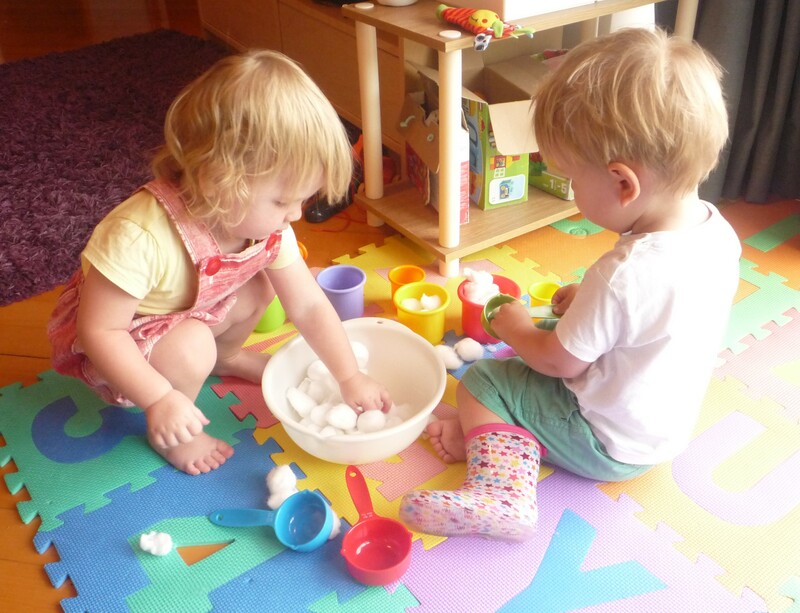 Another simple (and low mess) activity is to get a bag of cotton wool balls out. Add in some pots to put them in and out of and some scoops or spoons to help transfer the balls around and you’ve got a great activity. This one doesn’t keep my twins entertained for too long at a time but they do like it! Sticking pipe cleaners into the holes of a colander is surprisingly entertaining when you’re almost 2. 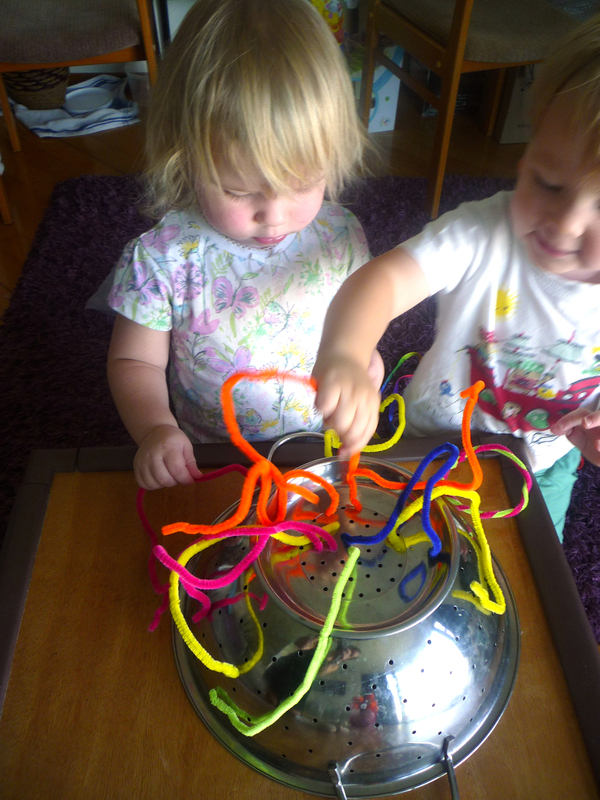 When I first tried this activity with the twins a few months ago, they found it quite frustrating as it was just that little bit too difficult for them to get the pipe cleaners in the holes but now their fine motor control has improved to the point where this is a great activity for them. And you don’t have to limit it to the colander either! 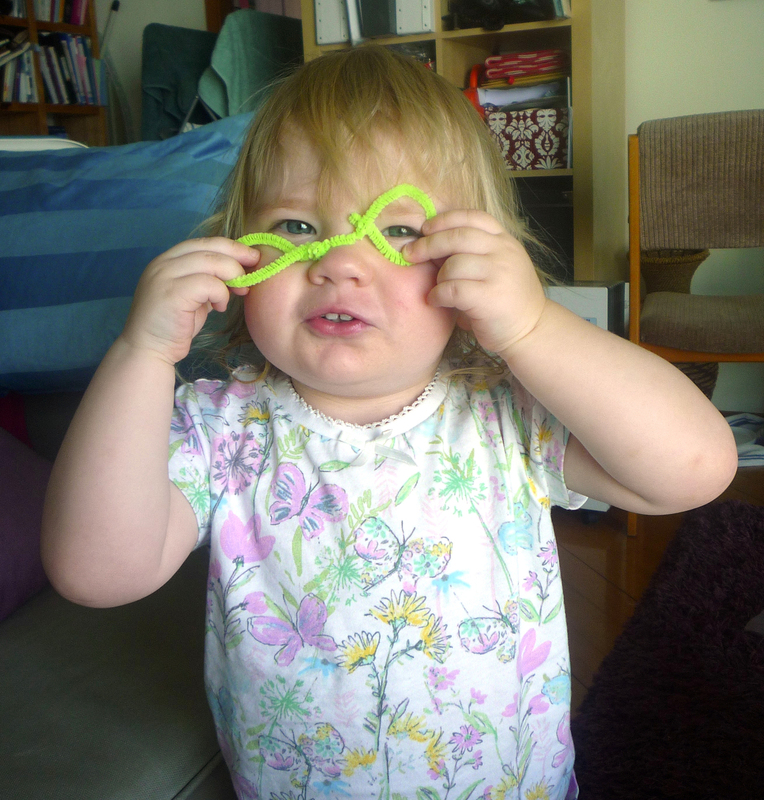 Pipe cleaners make great bracelets, hats, necklaces and glasses! 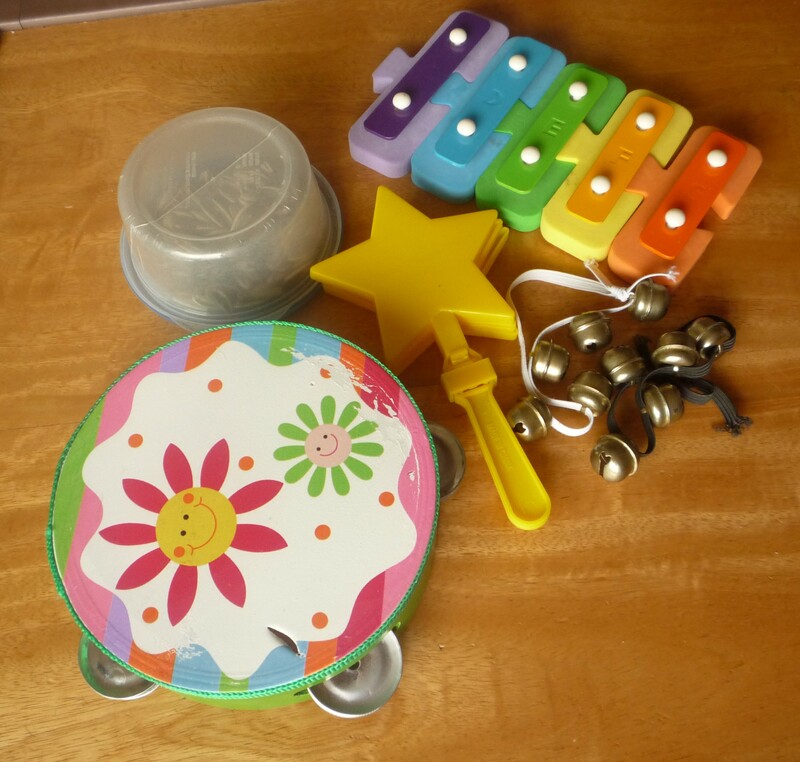 So those are just a few ideas of activities that you can do with a toddler. There are lots and lots more that I have pinned to my Activities for Toddlers board on Pinterest so check it out if you’re looking for more inspiration!